Rishikesh exists in a delicate balance between city, nature, tourism and spirituality. Nestled against green rolling mountains and next to the start of the Ganges River, it’s reminscant of San Francisco in the early 1900s. During my month in Rishikesh, I wandered around with my camera, attended religious ceremonies, made new friends, hung out with old ones, learned the art of Laughing Yoga, and, most importantly, relaxed! Now, I invite you to enjoy an overview of life in Rishikesh … alongside some of my favorite photos from my time there. While the city area itself is quite large, Carrie and I spend most of our time in a little rectangular space a few miles long. Split down the middle by the Ganges River, one main road runs from top to bottom on both sides while a pair of bridges connects them. At either end of each bridge, there is a pocket of commerce, guesthouses, ashrams, temples, yoga centers and urban existence. As pilgrims come to Rishikesh from all over the world to visit, pray and cleanse in the Ganga, you can imagine there’s always a crowd. The city is like Varanasi, but on a much smaller scale. Alongside the pilgrams, scores of travelers – Western and Indian alike – spend days roaming the streets, eating, shopping, visiting temples, bathing in the Ganga, snapping photos and taking it all in. While some come for just a day or so, the majority stay for weeks at a time. I was joking the other night that I could spend my entire six month visa just relaxing here. The scenic town of Rishikesh, India, with the foothills of the Himalayas as a background. Spiritual tourism is the #1 business in Rishikesh with new guesthouses, ashrams, shops and infrastructure always under construction. 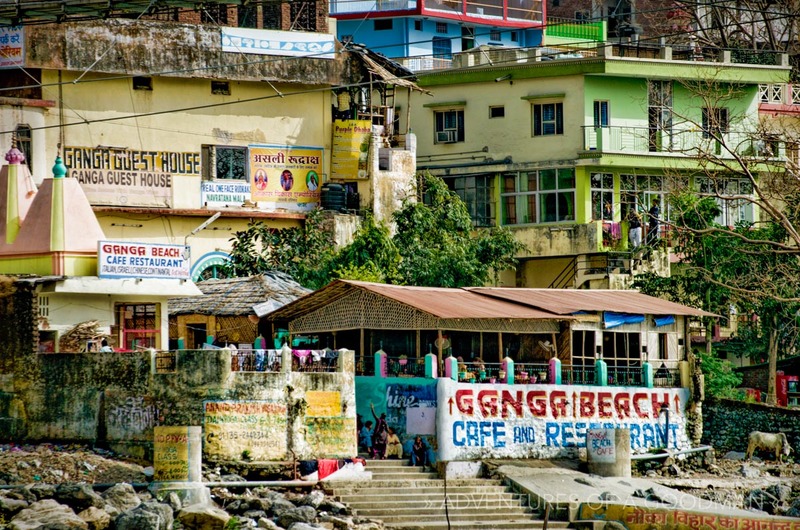 Alongside the Ganges – India’s holiest river – buildings are covered with signs advertising courses in yoga, meditation, energy, Reiki and more. Like anything in India or elsewhere, some of the classes treat the subject matter and participants with respect. Others, of course, are just in it for the money and do the bare minimum to get you back out the door. If you’re coming here for this purpose, do your research and choose wisely. If you’re not in Rishikesh looking for a spiritual journey, it’s still entertaining to wander around and check out the never-ending collection of signs. When I arrived in Rishikesh, my wife, Carrie, had already been there for two months studying yoga. This meant that I was on my own. Good thing getting to Rishikesh was pretty easy … albeit quite time-consuming. …and there she was. My beautiful wife, walking up the street just as I turned off the bridge, as if she knew I had arrived. And once again, all was right with the world.